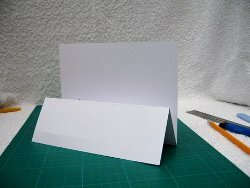 Ever made stand up cards and can't make them stand? I have ...until I discovered this easy way to get them to do what I want. 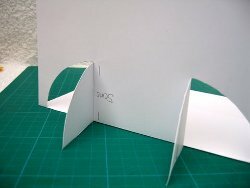 Take your A4 card and lay it on your cutting mat . Fold in half and crease it sharply. 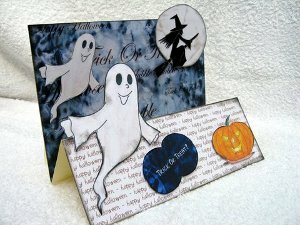 Look in card blanks for tips on how to do this neatly. 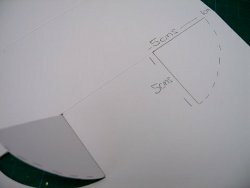 From the short edge measure in 7.5cms, score and fold the opposite way, and your card should now look like the one in the photo. 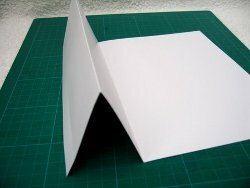 Open the card out, with the wrong side facing upwards, and from the centre fold onto the largest side measure in from the outer edges 1cm and 6cms, and leave a pencil mark. Then measure up the card, from the 6cms dot, 5cms and make another mark. Join up the marks along the spine and up the long piece to give you an angle that is 5cms along each side. From these two lines make a dotted curved line. Your card should now look like the one in the photo and when these two flaps are bent the card will now stand up by itself. 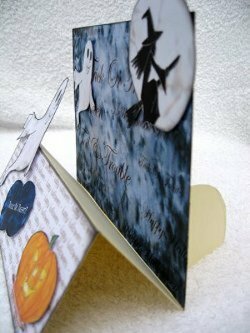 When the card is turned around this is what you will have and of course it is now ready for you to decorate as you want. This picture gives you some idea of the layout of the elements I chose. You can make stand up cards for anything you want.